No Halloween costume for me this year. I’m still getting in character for my new everyday role as a widower. But my time will come around again, and meanwhile I’m thinking of the costumes I wore in the past. The earliest costume I remember was a cowboy, put together when I was four or five., under the influence of Lone Ranger episodes, whose introduction I knew by heart. I was under the belief that the costume would actually disguise me, and was bitterly disappointed when people had no trouble recognizing me. The next costume I remember was a monk’s habit, salvaged from a play in Grade Two that never happened. To my outrage, I had been cast as Friar Tuck when my destiny was clearly to play Robin Hood, or at the very least Little John. But, next Halloween, I added a skull mask to the costume. I remember in my juvenile cunning, I figured that, if I took off the mask, I would have a completely different costume, and could go around to the houses twice without anyone noticing. I was right, too, although my conscience kicked in after the fourth or fifth house and I stopped the deception while keeping the candy. Treasure Island must have produced a pirate or two, because I remember a plywood cutlass that my father cut out for me and spray painted silver. But the next costume I remember clearly was the remnants of my Cowardly Lion costume from the Grade Five production of The Wizard of Oz. I had loved acting, and using the costume for Halloween was a way of hanging on to the excitement of the production a little longer. Then came the age when I thought myself too old for trick or treating. It started in Grade Seven and lasted until my second year at university. By then, I was in the medieval club, and used to dressing in costume most weekends. But for medievalists, Samhain, the Celtic predecessor of Halloween, was always a major event. Once or twice, I simply went in my usual persona of Ullr Ericsunu, the Icelandic farmer sojourning at the court of Athelraed Unraed in England. But for Samhain and other events, I also created a minor persona of Alain d’Alancote, a small-time Breton merchant living in York, so I would have an excuse to wear fourteenth century costumes with dagged hems and sleeves. Alain was born of the medievalist custom of coming to Samhain as an ancestor or descendant of your main persona – although how exactly Ullr and Alain were related, I never quite figured out. However, Ullr and Alain disappeared when I left medievalist circles, and so, for the most part, did the costumes. I remember once pulling on a farmer’s smock that Trish made for me, and lugging along Ullr’s shepherd crook, which became a nuisance by the end of the evening. Right now, I have no idea what my life will be like next Halloween. But, judging from my enjoyment of the costumes I’ve seen on the Skytrain in the last few days, I suspect I will be spending it in costume – and about time, part of me is muttering. Miniature masks and sculpture are a test of an artist’s skill. They are merciless about showing who has a steady hand on the carving tool or the paint brush, and who cares about finishing details. 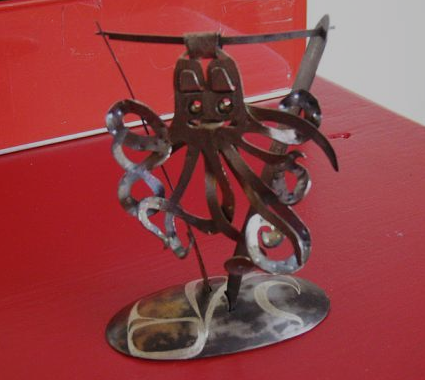 Often, too, they demonstrate an artist’s ingenuity. Tsimshian / Haida Mitch Adam’s “Peaceful Warrior” (shown below roughly full size) is an example of all these things, which is why I jumped to buy it when I learned it was available. 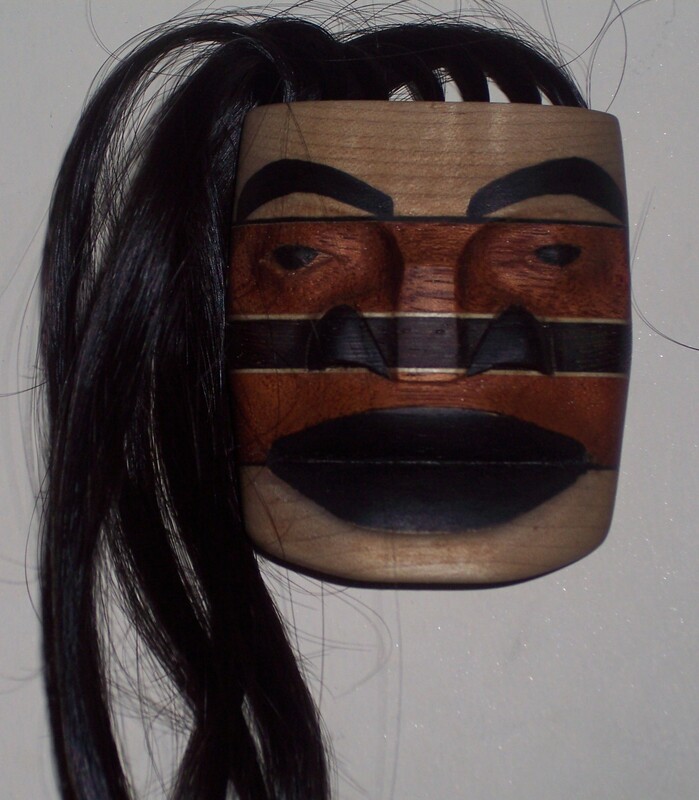 The mask is one of two that Adams carved from a block of laminated wood (the other is currently in the Spirit Wrestler Gallery). Except for a few pieces, such the eyebrows, the pupils, the lower lip, and part of the nostrils, what you see is not paint, but the natural colors of different layers of wood. From the outside working in, the layers are Swamp Ash, Ebony, Mahogany, Maple and Wenge. Adams has chosen to make so few additions to the block that you might call the result an example of minimalism. Faced with such ingenious economy, what can I do except try to imitate it, and let the mask speak for itself? If my late spouse Patricia Louise Williams had been an opera buff, I might have arranged a special performance in her name for charity. Had she loved walking in a particular park, I might have arranged for a bench with her name to be placed there. 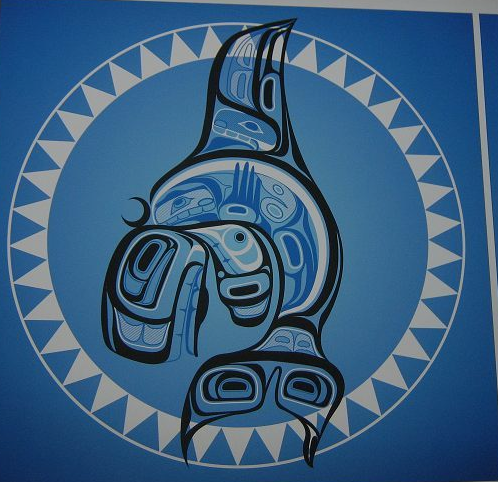 But, because three of her favorite things were needle art (embroidery, cross-stitch and other related techniques), our parrots, and Northwest Coast art, I took an inspiration from Rande Cook’s “The Poet” and commissioned a limited edition of 20 prints and 5 artist proofs from Haisla artist John Wilson, one of our favorite artists. The design process was interesting, because I had never been so heavily involved in it before. John and I chatted about what would go into the print a couple of times on Facebook before coming up with the final idea. I also talked with Mitch Adams, the artist-turned-printmaker as he was producing the prints and last minute changes were needed. 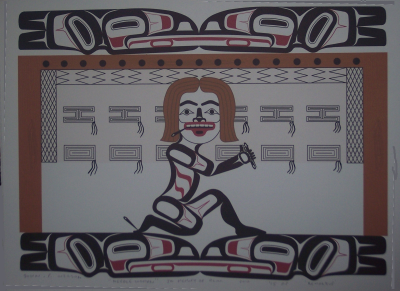 Essentially, the print is meant as a one to one transposition of her life into the cultures of the northern coast. The print shows a stylized woman (complete with labret) at a loom, which is a bit of wish fulfillment, because traditional weaving was something that Trish had dabbled in and always wanted to go more deeply into. Similarly, our four parrots become four ravens, their counterparts in the northern hemisphere, who also happen to be psychopomps – that is, conductors of the dead into the afterlife. The print includes a number of reference and in-jokes, some public, and some private. The pattern on the loom is unfinished, reflecting the fact that Trish died relatively young, and with many things unfinished. 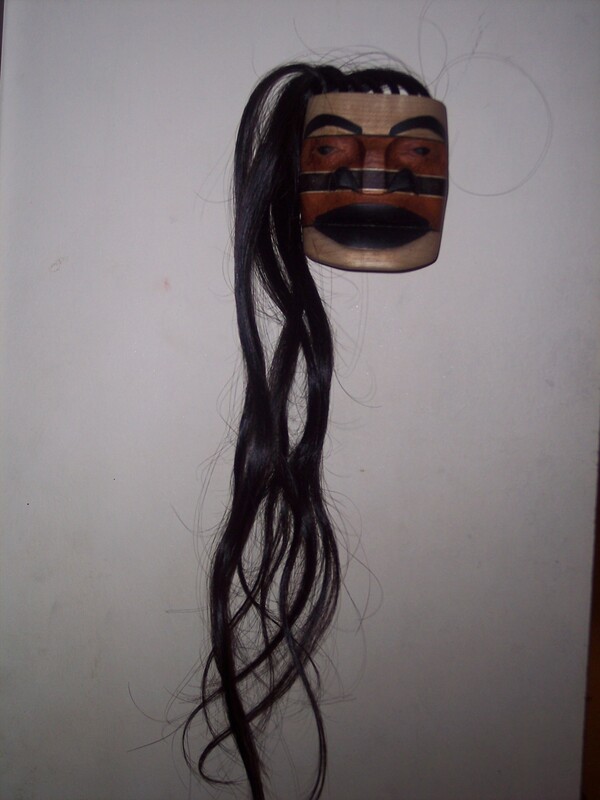 Moreover, the pattern itself is Raven’s Tail, one of the oldest weaving patterns known on the coast, which ties in with Trish’s lifelong archaeological interests. In the same way, the tongues of the ravens are touching, which traditionally indicates communication or the imparting of wisdom. If you have ever heard either parrots or ravens, you will know just how unlikely that sounds when applied to them. To catch the other references, you would need to have known Trish. She was always holding needles in her mouth as she worked, which could make a kiss in passing a dangerous proposition. Also, like all needle art practitioners, she was always dropping needles – which one of us would eventually find by being stabbed in the foot. It’s all part of the gentle humor in the print which reflects Trish’s own. I suppose some people might leap to accuse me of cultural expropriation. But if nineteenth century argillite carvers could depict Europeans in top hats, or Norman Tait could carve a mask that included a camera, I think that “Needlewoman” is on safe grounds. People often forget the sense of humor in Northwest Coast art, and I make no apology for restoring some of it, especially when it’s appropriate to Trish. Like all art, “Needle Woman is comforting to have – and so is sharing copies of it with those closest to Trish. Thanks, John, for an original and moving piece of art. An online friend has taken me to task about the anger in my posts about grief. I started to reply privately, but my comments quickly turned into a post of their own. After all, it’s a difficult question: how do you support someone in mourning? True, I think that the friend has misread the anger. I don’t attack people just because they hand me bad poetry for consolation, or toss cliches my way. If anything, in person, I am generally too polite; I not only suffer fools gladly, but actively encourage them. I write my frustrations so that I don’t express them face-to-face. Nor do I write simply to express a peeve, although probably I have sometimes taken advantage of the added tolerance extended to people in my position. If I mention specifics, it’s not an attack on the person involved – it’s because I want to illustrate something that’s widespread. In writing about grief, I am venturing into the confessional realms of writing. When you are writing in the confessional mode, what you are doing is reporting the view from where you are at the moment. For that goal to have any value or interest (even to myself), the reporting has to be as honest as I can make it. Leaving out the anger would be a distortion, so I’m not going to do it. I’m not proud of the anger, but I have to report it if I’m going to approach the subject at all. The fact that very few people write in detail about grief makes me all the more determined to be as honest as possible. Still, my friend has a point. Having written about how not to handle someone who’s grieving, to be accurate I need to express the view from the opposite perspective. For example, I will always be grateful to the friend who, a few days after Trish’s death, invited me over to hangout one Saturday afternoon. She didn’t approach the topic, and we didn’t do anything more serious that talk idly and walk her cat, but that brief oasis of normality was exactly what I needed. A few weeks later, we went to a coffee shop, with the same basic ground rules, and, again, I felt relieved to be doing what other people were doing. People online can do much the same by emailing and chatting regularly. The effect isn’t as strong as in-person contact, but don’t let anyone tell you that online relationships are invariably shallow. There have been days when having a chat window pop up was the only thing between me and complete depression. The thing is, grief separates you from the everyday, and even if you are not ready to rejoin the daily grind, you appreciate the knowledge that it’s still out there. Then there were the four or five people who have helped me sort Trish’s property and make sure that as much of it as possible got into the hands of people who would appreciate it. Hording it (except for select exceptions), seemed wrong, and dumping it or sending it to Value Village to be pawed over by strangers felt even worse. But there was far more stuff than I could easily sort and move by myself, and working beside others is one of the best ways I know to feel that you are connected to someone. If there’s not property to dispose of, then housecleaning or cooking can serve much the same purpose. Later, you might make an effort to invite the grieving person to a quiet group activity. They are unlikely to want to go dancing until dawn, or to be the center of attention, but just being with people can be comforting. Of course, you can’t expect too many expressions of gratitude for any of this support. The emotions of a person who is grieving are out of control, and expressing even a relatively mild emotion like gratitude can break what little control that they have. But you will know if they appreciate your efforts by the simple fact that they respond. But no matter how you support those who are bereaved, move slowly and at their pace – the rules that apply to taming an animal. What you do will be frustrating and never seem enough, but it will still be better than reacting in stereotypical ways or with cliched phrases – and considerably better than nothing at all. Three and a half months after my spouse died, I found myself attending another memorial service for her. Officially, that wasn’t what the Trish’s Stash Sale was about, but in practice that’s what it was, particularly for me. Trish had many virtues, but tidiness was never one of them. When she died, she left three decades’ worth of craft supplies in our townhouse. Crochet, cross-stitch, hardanger, blackwork, ribbon embroidery, weaving, knitting – you name it, and at one time or other Trish had practiced it. With the help of her friend Lin, Lin’s husband, and Trish’s sister Marion, I hauled nearly a hundred boxes and bags out of the townhouse,divided into rough categories. Then, the Coquitlam Needlearts Guild (to which Trish had belonged for many years) started sorting it, and eventually decreed the sale to make sure that as much as possible of Trish’s craft supplies found someone who could use it. I was asked to contribute a picture of Trish, and a picture of our parrots with the caption, “We Contributed the Seeds!” (apparently, some Guild members with poor closeup vision had worried during the sorting that the seeds were an insect infestation). I also provided frame art cards for some forty of those who helped with the sale, and a box full of Trish’s trademark origami ornaments to give out as further mementos. When I arrived at the Scout Hall in Blue Mountain Park in Coquitlam today, I was prepared to help with setup. As the technical owner of the craft supplies, I felt a certain obligation – similar, I joked, to that of Doctor Frankenstein to his monster. But, despite the fact that it was barely 8AM (on a Saturday! ), most of the work was already done. I knew that some of the supplies had been already claimed by the volunteers for their unpaid efforts. Other things were being held back for Guild members to counter the increasing rarity of craft stores in greater Vancouver. Even so, Lin had told me yesterday that she was worried that what remained would never fit into the hall. Fortunately, her concern was unwarranted. With an efficiency I can admire but never hope to match, the Guild had gone beyond my crude sorting to bag and price everything, and arrange it on tables. Working alone, I doubt I could have done the job in less that a couple of years – although, as the day wore on, that estimate expanded slowly to ten years. The effort was both extraordinary and unexpected. I set up just inside the door, and found a stool to perch on. I was given a blue ribbon to wear to mark me as a volunteer – or “a friend of Trish,” as the organizer put it. By 8:40, the volunteers had turned into customers, and the first part of the sale began. It was for Guild members only, at half the price the general public would be charged. I quickly settled down to a morning of urging ornaments and copies of the program from Trish’s memorial service to anyone who passed by my table. Often, people stopped to express their condolences. At times, I walked through the sale, remembering some of the items for sale, and sternly resisting the urge to buy anything back. More than once, a kind word or hug sent me stumbling outside until I could master the tears that were never far away. At lunch, I wandered down to Austin Avenue for a sandwich, and returned with a dozen donuts. Almost all the volunteers bemoaned the calories, but most took at least half a donut. In the afternoon, Trish’s sister Marion arrived, and so did their friend Nancy, who had visited Trish during her last stay in the hospital. The afternoon continued much as before. As expected, the slowest sellers were the magazines, even though they had priced to sell. But the reference books, patterns, yarn, buttons, beards and fabric squares all sold between 50-70% of what was on the tables. But by 3:30, people had stopped coming, so takedown began with the same efficiency as setup. At the last moment, a woman took all the miniatures magazines. That still leaves all sorts of charities doing baby clothes for poor mothers, quilts for women’s shelters or fire victims, and school craft programs to benefit in the coming weeks. Meanwhile, although expenses still have to be calculated, $2000 seems to have been raised for the Mature Student Award at the Freda Diesing School, which Trish and I founded in 2009. Trish had wanted to make sure that her craft supplies went to those who could use them, and the Mature Student Award was something she was proud to have helped create. For these reasons, the sale felt like a last gesture of respect to Trish from some of her closest friends. I’d like to thank them for that, and for their kind words about Trish and their kind treatment of me. Although I was left emotionally exhausted, so far as I’m concerned, I couldn’t have too many days like today while I actively mourn for her. Short of her still being alive and healthy, seeing good done in her name was the best thing that could have happened for me. Face to face and online, people keep telling me that I am bearing my wife’s death well. The truth is, what I am really doing is maintaining the appearance of normalcy. I have just enough sense remaining to realize that people don’t want to hear the details and that what I am enduring is unimaginable to most people who have not gone through it themselves. Certainly, it would have been unimaginable to me before this summer. I tell myself that I have learned from the parrots in my living room not to show vulnerability. Scream, puff yourself up, or cause a disturbance, but don’t let anyone know that you’re tired or ill: That’s their credo, and I can understand it. Grief is a private thing, and I don’t generally care to share it, except with those who already feel it. I’m here to say, though, that surviving a spouse of thirty years is like nothing I’ve ever experienced – and I’m not exactly a stranger to trauma. It’s not even like other griefs, except maybe in general outline. To start with, my situation means endless details. Quite aside from funeral arrangements and telling friends and relatives what happened, my life has been full of canceling subscriptions, changing the name on assets, dragging through probate, arranging new medical coverage, talking to my accountants to my lawyer, and to my financial advisor, and dealing with government agencies and officials of all sorts. Just when you are least able to handle bureaucracy, an avalanche of it is waiting to overwhelm you and suffocate you. Yet these distractions are the least of surviving a spouse. My situation is also about noting a joke or a situation, only to remember that you no longer have anyone with whom to share it. It’s having thoughts that you no longer have anyone to confide to. It’s learning to cook for one person instead of two. It’s realizing that there is no division of labor – if you don’t do something, it doesn’t get done. It’s breaking down half a dozen times a day over trivia like an old photo or shoe, or watching a video and remembering that your partner never got to watch it, or thinking of a trip that she’ll never take now. It’s a sudden pain in your abdomen that has you worrying about appendicitis but is really just a new manifestation of anxiety. It’s waking up with your hair and your sheets cold with sweat, and getting up in the morning feeling like a hand is pushing against your chest whenever you do anything. Then, just as you are getting some distraction from a video or book, so that you could almost belief that your spouse is out shopping or in the next room, it’s realizing that the respite is an illusion – that in dozens of tiny ways, your everyday assumptions no longer work. And that’s just the common themes. Stay home, and you are alone with the thoughts that you have come to dread. Go out, and not only are you surprised to see people going about their ordinary business, but that business seems trivial and unimportant. In fact, your whole relation to people change. You have less patience with people. Euphemisms like “passed away” or cliches like “I’m sure it’s all for the best” set your teeth on edge. You may find, as I did, that you have no longer have patience with other people’s foibles. You may even pick a fight, so viciously that, even when you apologize, the other person doesn’t forgive you, and you feel like an idiot for making the world a nastier place. You discover, too, that the way people treat you changes. For one thing, relative strangers feel they can now give you meaningless advice on how you should live. Also, you are no longer half a couple, but a lone individual for the first time in years. Many acquaintances and friends no longer know how to treat you. You are no longer married – and therefore, provisionally safe – to women. Things you could do or say as a married man now take on new implications, and are suddenly best avoided. This change in the expectations placed on you is especially ironic, because the last thing you are thinking of is a new relationship. If your relationship with your spouse was as good as mine, you wonder if you will ever have a relationship to match. You seriously doubt that you will, and, anyway, the steps that are usually necessary to develop even a potential relationship seem so ludicrous that you are seriously thinking of avoiding the whole subject for the rest of your life. In short, surviving a spouse means that the future, which for years you thought you knew in broad outline, is suddenly as indefinite as it was when you were fourteen. You discover, too, that you don’t really care. In theory, you could start staggering down a new life path, but that would require giving a damn – and you don’t, not really. Taking a course or joining a meetup would just be a new way to pass time, and travel a lot of effort just so you can go somewhere else to be alone. Far less effort for me to show the facade they prefer. That way, everyone else can keep their illusions intact. Looking at the artistic career of twenty-six-year-old Morgan Green, the first thing that strikes most people is how varied it has been. But probably, that variety comes naturally. 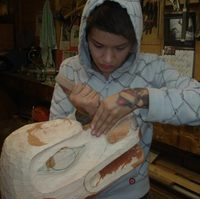 With an art teacher for a mother, and master carver Henry Green for a father, Green has been surrounded by a variety of art all her life. In fact, Green’s first formal training after graduating from high school in Prince Rupert was fashion design. 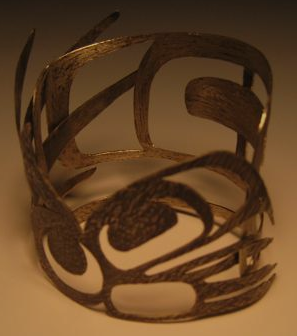 However, since then, she has also studied bronze casting, molding technique, clay sculpture and goldsmithing, as well as learning wood carving with her father and Salish carver Jordan Seward, and jewelry-making with Haida artist Richard Adkins. With this background, Green is already making a living as an artist, although, like most artists, she has also had the usual array of odd jobs, ranging from commercial fishing to waitressing. Of mixed Scottish and Tsimshian background, Green shows a similar diversity of influences. In general, she says, “I admire artists who work hard.” However, asked to name artists she admires, the first one she mentions is Art Nouveau artist Alphonse Mucha. Since Green makes her living as an artist, she describes herself as “somewhere in mid-stage of my career. I feel like my artwork is still maturing, but the quality is good, and I’m happy with where I’m at. I’m not really one for major production or commercialism (I like to make things one of a kind, and I believe in locally made), so I’m lucky that I have supporters who believe in me. Right now, Green thinks that “My career is at another jumping off point.” Continuing to work in a variety of media, she says “I see it all as connected. The processes are all different, but have similarities. A lot of [working with a new medium] is learning how to work best with the properties of the material. In addition, Green is also concerned with violence against women, and was Jordan Steward’s assistant a few years ago on the pole to commemorate missing women in Vancouver’s Downtown Eastside. An armchair psychologist might be tempted to speculate that Green is trying to combine the interests of both her parents in her own life. However, those who know her might be more tempted to say that her ambitions are just Morgan being Morgan, looking ahead to more of the diversity that has already characterized her career.